Personal style. It's just that - personal. But I guess you could say I've become increasingly selfish with it. Wanting to challenge myself more and more. To push my fashion boundaries. 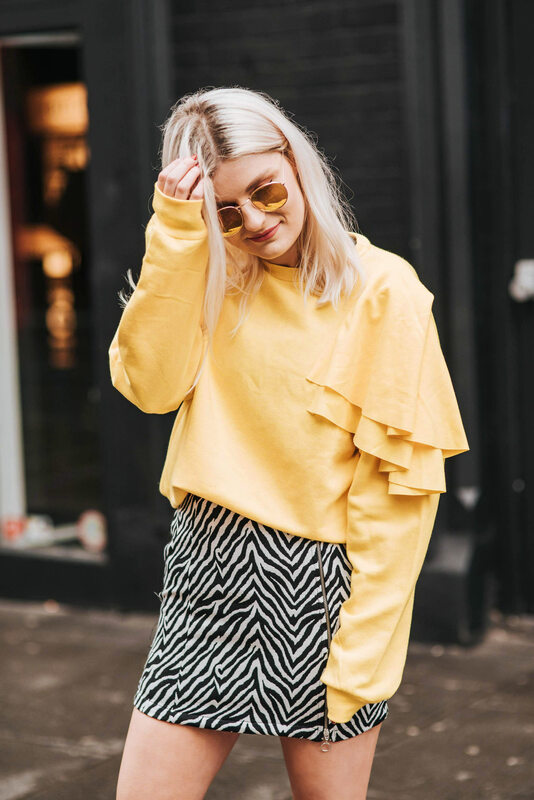 I've added a few interesting pieces to my wardrobe recently, so I thought I'd let you in on how I'm continuing to progress my style. When I say interesting... 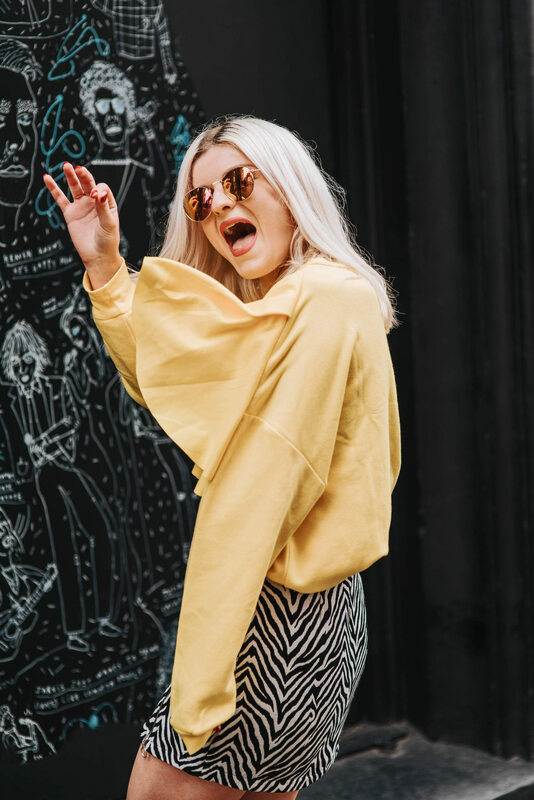 I mean... have you SEEN this yellow jumper with kinda-crazy shoulder flaps?! How 'fashion-meets-Big-Bird' of me. I document any outfits or visuals that inspire me. Even if I don't think they're very 'me'. I use these visual prompts to consider new fashion ideas I might want to try out. Instagram and Pinterest are my (obvious!) go-tos for saving style inspo. Instagram is pretty limited, as you can only save images from the platform. Still, I find this quick and helpful to have. But over the past year or so I've really got into using Pinterest to store style ideas. Through my Pinterest homepage I can also discover really awesome things that I'd never see on my Instagram feed. It gets me thinking outside my 'selected' style influencers and sometimes makes me feel a little more refreshed creatively. 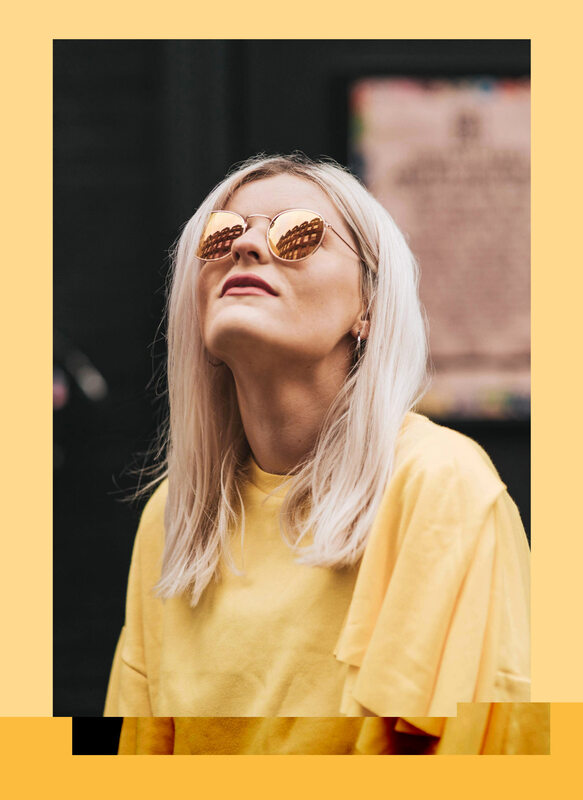 All this gives me a shed load (probably literally) of fashion inspo to think about. I might have a passive browse of the 'new in' sections of my favourite fashion places like ASOS. Sometimes I'll come across gems that remind me of images I've pinned recently. 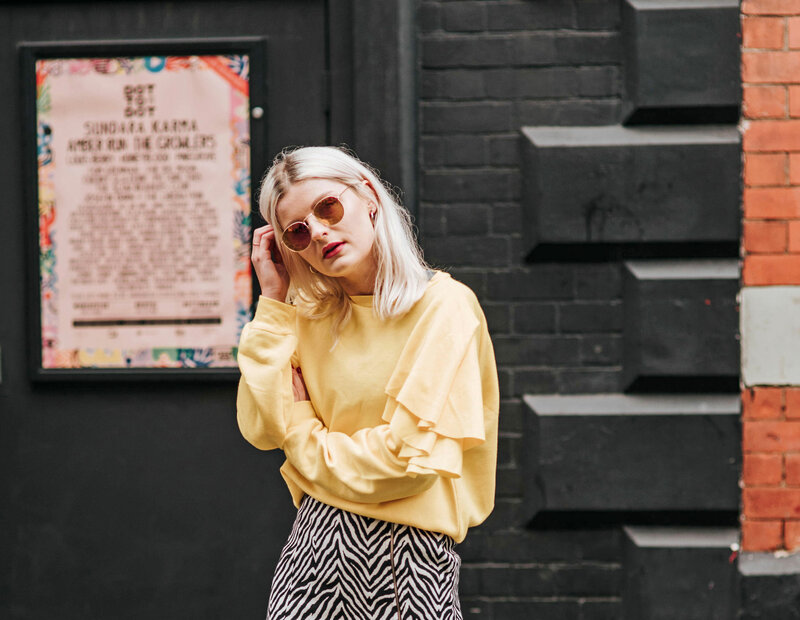 Like this yellow jumper from Mango. 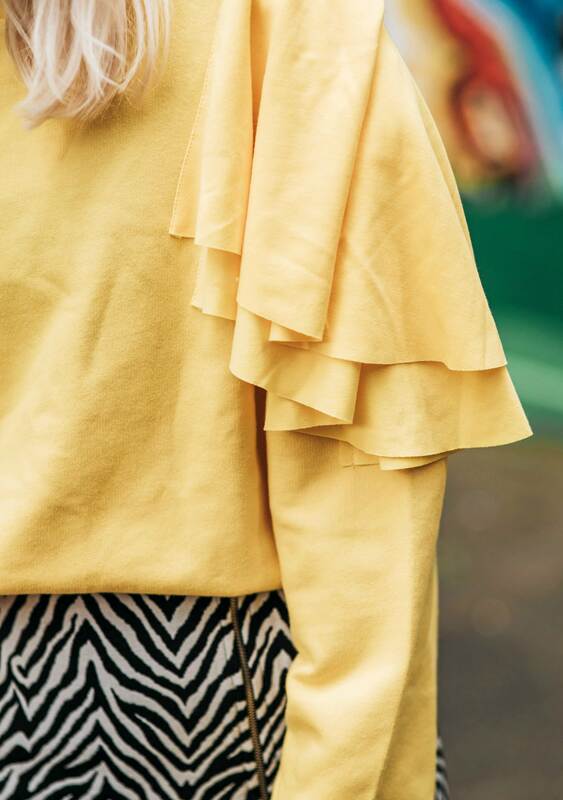 This jumper was an absolute treat to stumble upon, after I'd been pinning boldly coloured frilled items for a month or so! Then there's the reverse approach to this too. Proactively hunting for stuff, based on photos. Once I have a specific idea in mind, I'll go on a hunt for it. This is where you want an epic search tool... ASOS always wins out for me in this respect too! You can't beat the ease of free delivery and returns when you're not 100% sure something is going to be a keeper! 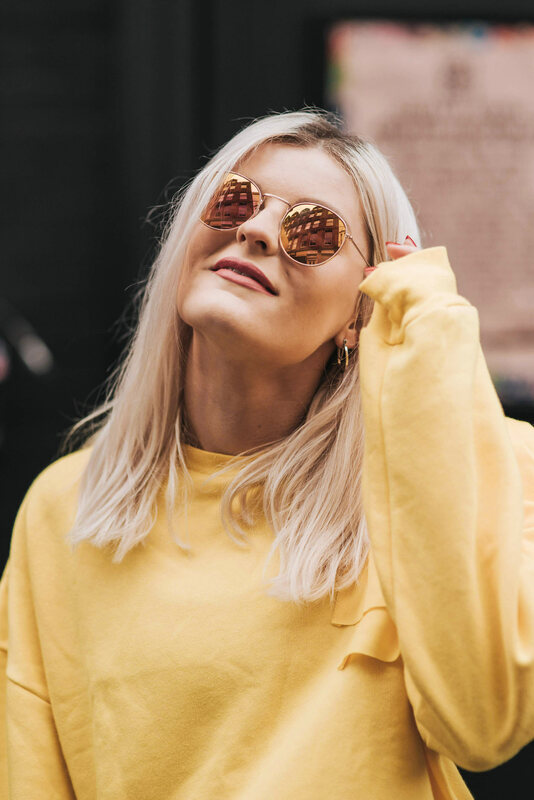 Of course, you could keep things simple and buy exactly what you see your fave blogger wearing. I like to have a play around with my existing wardrobe too, trying out new combos with my clothes. From time to time, outfits I like will actually be made up of items I already own. Just goes to show, by mixing up how you pair your current garms, you can easily venture into new style realms! 3. Try it on... but do it right! As mentioned, this jumper was a little outside my usual fashion choices. I had to convince myself that it was going to work. This is again where I feel online shopping wins out! Trying things on in the comfort of my home, with my wardrobe to hand, and no changing room stress makes the decision to keep or return 10x easier for me. 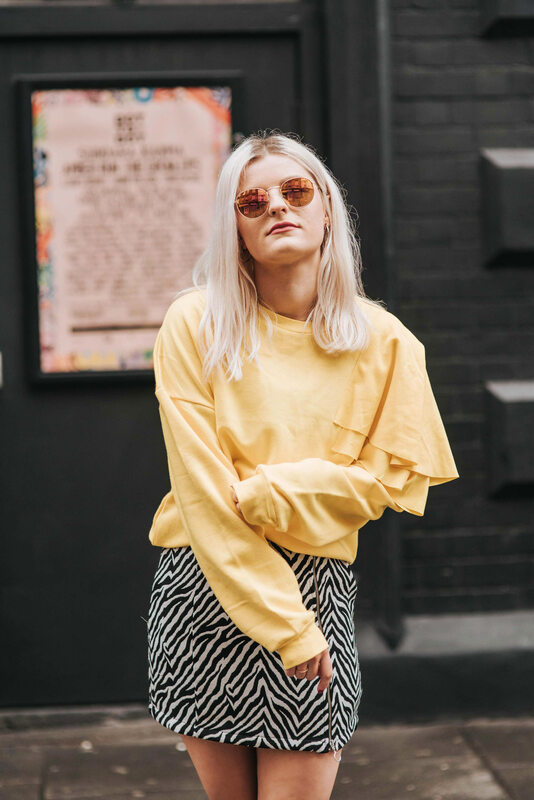 I thought this jumper wouldn't be very wearable... but actually, it goes with just about any denim and pairing it with this zebra print skirt works well! Basically, don't be scared off! Once you've braved buying your boundary pushing item, make sure you try it on right. Give it a real chance! Throw your new piece together with some of your wardrobe faves. If you like it then, you know you're onto a winner that you'll genuinely wear! I look like Big Bird in my canary yellow delight from Mango (ain't nuthin' wrong with Big Bird. He's a cool guy). It could even be described as an 'eyesore'. Yellow might not be 'my colour'. The shoulder frill might 'accentuate' my kinda-broad shoulders. And it might be the most 'man-repelling' jumper you've ever seen. I've never really set out to impress anyone else with what I wear. Again going back to the selfish point - in recent years at least, I've been far more concerned with having fun with my outfit choices. The times I revel in fashion the most are when I really challenge myself. So I'm going to continue forever-more to get more out of my personal style by seeking a shed-load of inspiration and continuing to give absolutely zero fucks about what other people may think about what I wear. Here's to more Sesame Street-esque clobber and being style-selfish. I love this look, and your tips are so true. Best just to do you and not care what anyone thinks! LOVE this! All so very true! I think you look fab and the jumper pleats and pleats on your shoes are great together! I always buy and try on at home, without any pressure. 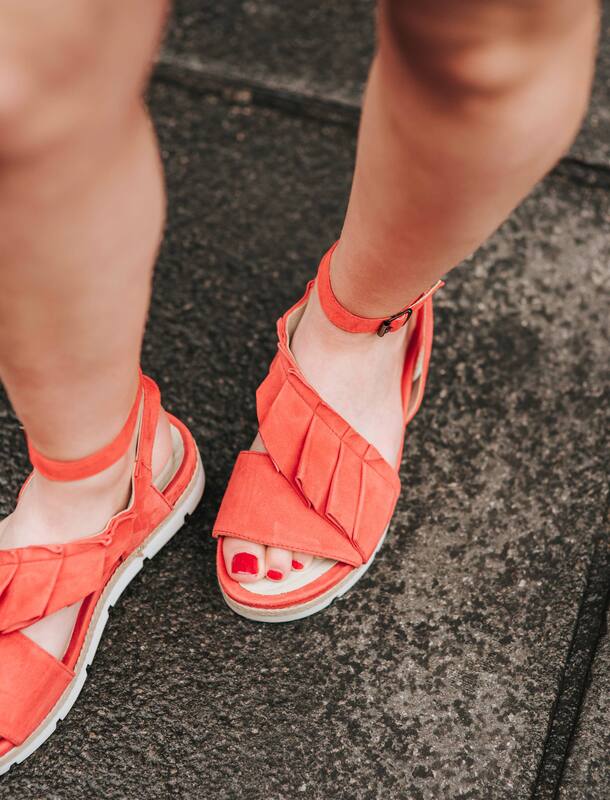 Like you say, if you've purchased something a little different to normal, it's good to have your other clothes and footwear on hand, so see how it really fits in. Awesome outfit (those sandals are cool af) and tips !